Staying with a welcoming family. We are professional and value everyone who has chosen to stay with us. Our family is very active and we're out in the nature hiking, biking or skiing as often as possible. Every morning we will let you know about the weather and latest news. We can help you to plan your day, give ideas or just tips for the best hiking trails, mountainbiking tours or beautiful walks in the valleys. 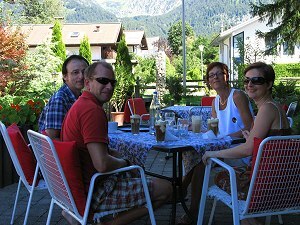 We are passionate about what we do, aim to ensure that you feel comfortable in our house and enjoy your time in Oberstdorf.